HTC evo 3d is the best smart phone that has been produced by HTC, the unique feature that make it no 1 in the best selling list of Android phones in 2011 is the 2d and 3d switchable camera mode. It has 5 mp camera. 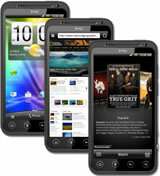 It has dual core processor with 1.2 ghz processing speed. Graphics has always been the appealing feature form Android. EVo. It has Android OS version 2.3.